Pullman began his career lifting buildings. Taking over a business started by his father, he moved warehouses and barns to allow a widening of the Erie Canal. During the 1850s, officials in Chicago decided to raise their whole city ten feet to allow for drainage of its mud-clogged streets. Pullman jumped at the opportunity. Directing hundreds of men armed with screw jacks and cribbing, he lifted houses and hotels, even an entire city block, without breaking a single pane of glass. More than anything, Pullman wanted to raise himself. The word “businessman” had recently been coined—a man who was neither merchant nor manufacturer but a mobilizer of capital, an entrepreneur. Pullman was a businessman by instinct—shrewd, gifted at calculating value, and always open to the new. Lifting and moving buildings was an exacting operation—hesitation or a lapse of control could mean disaster. It required careful planning, a commanding presence, and steady nerves. These were the qualities on which George Pullman built his success. Railroads had begun to dominate the landscape before the Civil War, and those who could look beyond that terrible conflict could see opportunity approaching. Pullman hired a substitute to take his place in the Union army and set to work fashioning a high-quality sleeping car. It was ready before the war was over. When the first transcontinental rail line opened in 1869, his business took off. George Pullman did not invent the sleeping car—most of the credit went to Theodore T. Woodruff, an upstate New York wagon maker whose car debuted in 1857. But Pullman contributed his share of innovations. He based his success on two ideas: luxury and revenue. Employing both traditional craftsmen and an early version of the assembly line, he created cars that appealed to the Victorian taste for ornamentation—lush carpeting, brocade upholstery, and chandeliers. He installed double-glazed windows and an improved suspension for a quieter, more comfortable ride. Rather than sell the cars, he retained ownership and contracted with the various railroads to add them to passenger trains as an enticement to customers. Pullman then pocketed the extra fare each passenger paid for an upgrade to Pullman luxury. This arrangement gave him a steady stream of revenue. It also meant that he kept complete control over the operation and maintenance of the cars. And those cars proved irresistible. Business travelers could sleep while they rode to the next day’s meeting. Middle-class customers could bask in tony amenities and attentive service. Hungry passengers could feast on gourmet fare in an ornate dining car, another Pullman innovation. For the very wealthy, he offered absurdly opulent private cars. Through buyouts and mergers, Pullman’s company gained a monopoly in the business. The name Pullman came to stand for quality and class. A staunch Republican, George Pullman followed the spirit of Lincoln when he offered jobs to freed slaves. The men served as porters on the cars. They catered to passenger needs and performed the intricate task of transforming a coach car into a rolling dormitory for the night. The Pullman Company soon became the largest employer of African Americans in the country. But in the conflict between George Pullman’s idealism and his instinct for making money, money usually won. He hired African American porters in need of work, but he paid them starvation wages—they had to rely on tips and endure the scorn of racist passengers. He created a town replete with flowers and greenery, but he charged exorbitant rents, posted demeaning rules, and allowed no town government. The company ran the show and Pullman’s spies invaded employees’ privacy. Still, his company prospered and Pullman reveled in his position as one of the grandees of Chicago society. His sumptuous mansion on Prairie Avenue, “the sunny street that held the sifted few,” was the scene of gala parties. Pullman and his wife spent a week with President Grant at the White House, and the sleeping car magnate hired Lincoln’s son Robert as his personal lawyer. Then came trouble. In 1893 a financial panic plunged the nation into the worst depression that American citizens had yet seen. Pullman laid off workers and cut wages, but he didn’t lower rents in the model town. Men and women worked in his factory for two weeks and received only a few dollars pay after deducting rent. Fed up, his employees walked off the job on May 12, 1894. 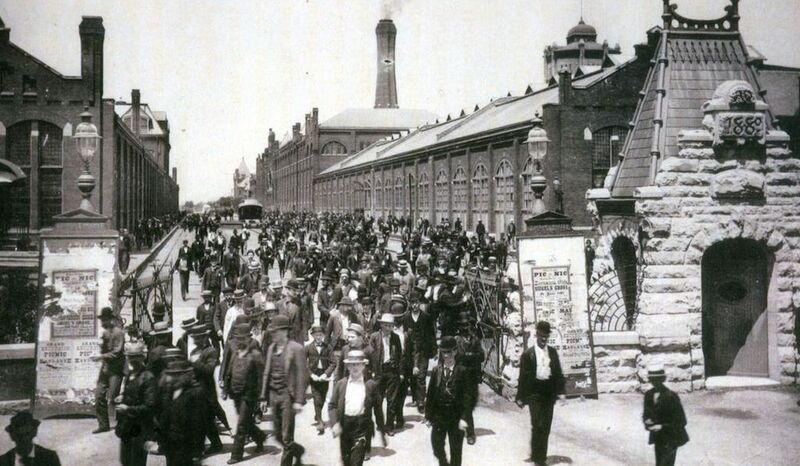 The Pullman strike might have attracted little notice—desperate workers struck against hundreds of companies during the depression. But the Pullman employees were members of the American Railway Union, the massive labor organization founded just a year earlier by labor leader Eugene V. Debs. At their June convention, delegates of the ARU, a union open to all white railroad employees, voted to boycott Pullman cars until the strike was settled. At the convention, Debs advised members to include in their ranks the porters who were essential to the Pullman operation. But it was a time of intense racial animosity, and the white workers refused to “brother” the African Americans who manned on the trains. It was a serious mistake. The boycott shut down many of the nation’s rail lines, particularly in the West. The workers’ remarkable show of solidarity brought on a national crisis. Passengers were stranded; rioting broke out in rail yards. Across the country, the price of food, ice, and coal soared. Mines and lumber mills had to close for lack of transportation. Power plants and factories ran out of fuel and resources. George Pullman refused to accede to his employees’ demand, which was to assign a neutral arbitrator to decide the merits of their complaints. The company, he proclaimed, had “nothing to arbitrate.” It was a phrase that he would repeat endlessly, and one that would haunt him to his grave. Railroad corporations cheered him on and fired employees who refused to handle Pullman cars. The railroad managers, determined to break the ARU, had a secret weapon in the fight. U.S. Attorney General Richard Olney, a practicing railroad lawyer even while in office, declared that the country had reached “the ragged edge of anarchy.” He asked courts for injunctions making the strike illegal, and he convinced President Grover Cleveland to send federal troops to Chicago and other hot spots to face down strikers. Although state governors had not requested federal intervention, U.S. cavalry troops and soldiers with bayonets were soon confronting rioters. Several dozen citizens were shot dead. Debs and other union leaders were arrested. Nonunion workers began to operate trains. The strike was soon over. George Pullman’s public image never recovered. The federal commission that investigated the strike judged that his company’s paternalism was “behind the age.” A court soon ordered the company to sell off the model town. When Pullman died three years after the strike, he left instructions that his body be encased in reinforced concrete out of fear it would be desecrated. Jack Kelly is a historian and novelist. His latest books is The Edge of Anarchy: The Railroad Barons, the Gilded Age, and the Greatest Labor Uprising in America .